Since our inception, Hitachi Construction Machinery has maintained a customer-first quality assurance system grounded in the legendary “Ochibo Hiroi” (gleanings) concept* of Hitachi, Ltd. In September 1995, we obtained ISO 9001 certification, and established the quality policies and quality managements system for the Tsuchiura Works. We also established the Corporate Quality Assurance Division as the managing organization to promote quality assurance for the entire Hitachi Construction Machinery Group. In addition, the Quality Assurance Center at the Tsuchiura Works, our mother factory, strengthen our quality assurance system for the group as a whole by sharing essential information with, providing guidance to, building awareness among the quality assurance divisions of each Group company. In April 2016, we launched the Global Quality Assurance Group. This group reinforced our support system for standardizing quality assurance operations at overseas group companies. The Corporate Quality Assurance Division oversees quality assurance operations at all of the Group’s companies in Japan and overseas. By doing so, we are able to standardize and raise the Group’s overall level of quality to achieve “Made by Hitachi” uniform global quality. HCM’s Customer Support Division and the quality assurance departments of each group company collect comments and requests from customers and sales & service personnel as well as information about problems with products. This information is then consolidated at the Quality Assurance Center, Corporate Quality Assurance Division. This information is reported at monthly product improvement meetings, which are attended by the president, and after investigation of the underlying cause of a particular problem, countermeasures are taken to prevent any recurrences of the problem in not only the product in question but all other similar products as well. *Taken after the Japanese name of the painting by Jean-Francois Millet entitled The Gleaners. To Hitachi this means fully learn from each and every past mistake to prevent a reoccurrence of accidents and defects that happened in the past. The HCM Group carries out “Ochibo Hiroi”, Hitachi’s traditional approach meaning “gleaning” in English, through which we learn from failure and further develop our technologies. In fiscal 2017, HCM along with four Group companies in Japan and nine Group companies overseas carried out gleaning activities. Our basic philosophy is to contribute to the enhancement of social capital and the improvement of people’s lives by developing excellent proprietary technologies and products. We are committed to providing customers with safe products and reliable technologies that fully meet their needs both inside and outside of Japan. The HCM Group carries out various initiatives in each division in order to ensure the safety of its products. If a safety defect is found in a product, the following countermeasures will be taken. If a product safety defect is found after shipment or delivery to the customer, the quality assurance department will contact the department responsible for countermeasures and inform the customer of ways to mitigate dangers as well as take appropriate action, such as recalling and repairing the said product, including those in inventory and already delivered. If a defect related to product safety is found after a product is already in use, the quality assurance department will identify the cause together with the department responsible for countermeasures and at the same time work together other related departments including legal affairs and services, to take action for preventing both the spread of damages and the future occurrence of similar defects. 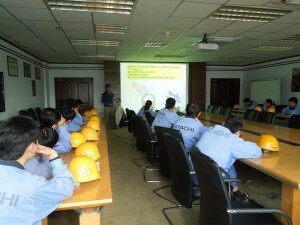 The HCM Group has established the Company-wide PS Committee as its management system for product safety. This committee promotes activities that ensure we supply customers with products with an even higher level of safety and reliability. We conduct a variety of employee education and assistance activities with the aim of standardizing quality assurance levels across the HCM Group inside and outside of Japan. We hold educational seminars to instill general knowledge on quality control including the Quality Control Course (Beginner/Intermediate), Reliability Engineering, and Product Safety/Product Liability Course. Moreover, the Global Quality Assurance Technician Training Program, which hosts trainees from overseas Group companies at the Tsuchiura Works to learn about quality control, has graduated 20 trainees to date. Currently, six trainees are undergoing training at the Quality Assurance Division at Tsuchiura Works over a one- to three-year period. Also, during Global Monozukuri Diagnosis activities in FY2017, a diagnostic technician for each of the processes at Tsuchiura Works, from assembly, machining, can manufacturing, painting, and quality control, visited 12 production sites around the world to visualize vulnerabilities in each of these sites’ manufacturing capabilities and quality management control through diagnosis, and provide assistance for improvement to promote the realization of Made by Hitachi. “Kataribe” (Storytelling) sessions are held in which senior experts in each field convey their operational approaches, failures and technical know-how to engineers working on the frontlines. In fiscal 2017, these sessions were held on 39 occasions at the head office and Group companies, reaching a total of 1,190 employees. In fiscal 2018, we will invite new speakers and set up new sessions, with the plan to hold a total of 40 sessions. In addition, the Global Quality Assurance Promotion Section for overseas Group companies created an information link called “quality information navigation” in fiscal 2017. Through this system, we collect and publish educational materials on quality control that have been translated into English along with manuals and record-keeping forms on the Tsuchiura Works’ quality control process and on detailed quality control operations. We began implementing this system in fiscal 2018 so that quality assurance staff at our overseas Group companies can easily browse through this information. The prompt disclosure of information about our products and services is vital to earning and building trust with customers. 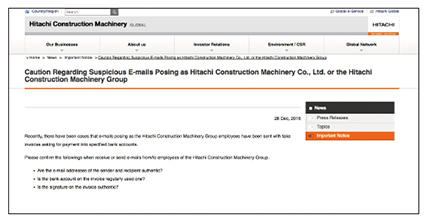 Therefore, Hitachi Construction Machinery shares information through various media, including its corporate website and social media, and strives to ensure customers are informed of information concerning recalls. For example, to ensure the quality and safety of our machines driven on public roads by customers, we collect, study and analyze information on defects that occur after a machine is sold. If a defect does not or may not conform with a safety standard, we have a system in place to ensure full compliance with the recall system stipulated in Japan’s Road Vehicles Act. This includes immediately issuing a recall notice to Japan’s Ministry of Land, Infrastructure, Transport and Tourism and repairing applicable machines free of charge. Also, we provide correct information on preventive maintenance to prevent breakdowns, after-sales care, and service campaigns.